This week’s cheese update is dedicated to some cheeses that have been out of the shop for a while (due to personal obligations, book signing tours, Hawaiian vacations, you know, the usual…) We’ve managed to get them back to Saxelby Cheesemongers, and oh boy are we excited about it! A delightful sheeps’ milk cheese from Vermont that tastes like crispy fresh cut grass mingled with toasted almonds and earth. An odd combination you say?! Well, alright, maybe it is. But one taste just might make a believer out of you. The rare and elusive Bloomsday… This cheese used to be made just once annually, on the anniversary of a day in the life of Leopold Bloom (from James Joyce’s Ulysses) but turned out to be so good, they had to make some more! Creamy and peanut-y and hearty to boot, this raw cows’ milk cheese is most probably what you’ve been craving. It’s like Bayley Hazen’s fat drunk British cousin came rolling into town to show off his swagger. Dang this cheese is good! A Stilton-esque blue, Bartlett is rich and fruity with a viscous, thick, and creamy paste. They’re cute. They’re affectionate. They’re mischevious. They smell goaty. 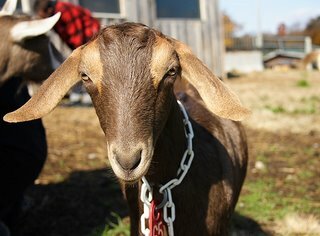 Three cheers for the good old Capra hircus (ie goat)! A savory, grassy and earthy wheel of goat goodness from the cellars of Twig Farm. It has the taste of flowers and grasses compressed into melt-in-your-mouth cheese! If you haven’t yet tried Twig Farm’s cheeses, shame on you. A tiny mold-ripened goats’ milk cheese that packs a tangy punch along with each and every creamy bite. Like Van Morrison said, well it’s a marvelous night for a moon dance… in cheese format. Beautiful, fresh and elegant, with a delicate white rind that somehow contains the perfect amount of musky goat flavor. These little mold-ripened pyramids are begging to be carved up at your dinner table. 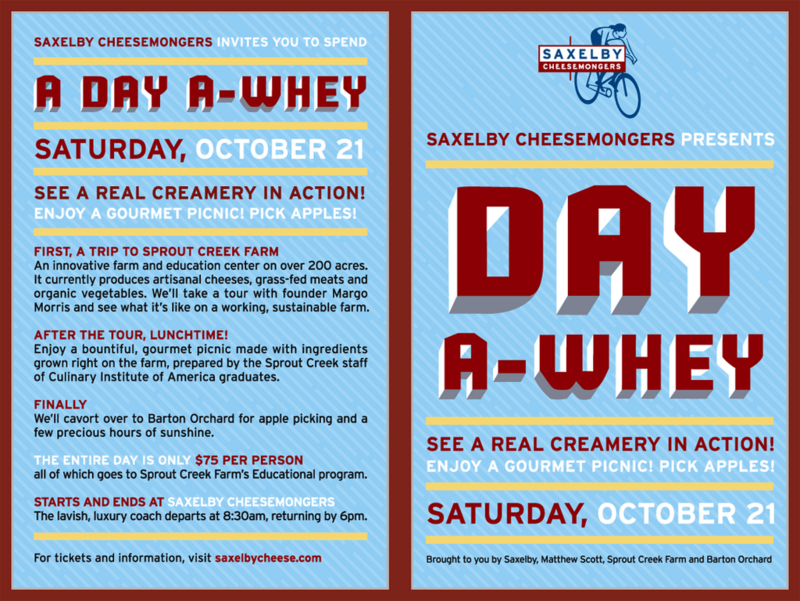 Calling cheese lovers, cheese nerds and anyone else who’s up for a field trip. See a real creamery in action! Pick apples in the golden sunlight! Enjoy a gourmet picnic surrounded by nature! First, a trip to Sprout Creek Farm – an innovative farm and education center on over 200 acres. It currently produces artisinal cheeses, grass-fed meats and organic vegetables. We’ll take a tour with its founder, Margo Morris, and see what it’s like on a working, sustainable farm. After the tour, lunchtime! Enjoy a bountiful, gourmet picnic lunch prepared by the farm’s staff of gourmet chefs made with ingredients grown right on the farm. Finally, we’ll cavort over to Barton Orchard for apple picking and a few precious hours of sunshine. 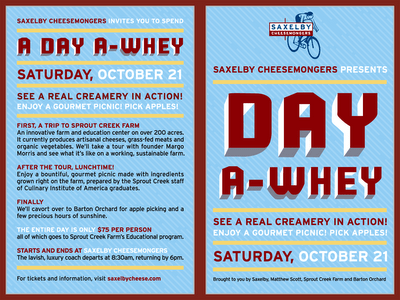 The entire day is only $75 per person, all of which goes to Sprout Creek Farm’s Educational program. The lavish, lush, luxury coach departs at 8:30am, returning by 6pm.